Latin : Cronartium ribicola J.C. Fisch. Blister rust is a very important exotic disease that kills white pine of all ages. The fungus first attacks the needles in the fall and many tiny yellow dots appear on the needles the following spring. Over the next year or two, the fungus spreads toward the branches and trunk. In mid-summer, orange pustules develop on the bole and exude a liquid containing a first type of spores. 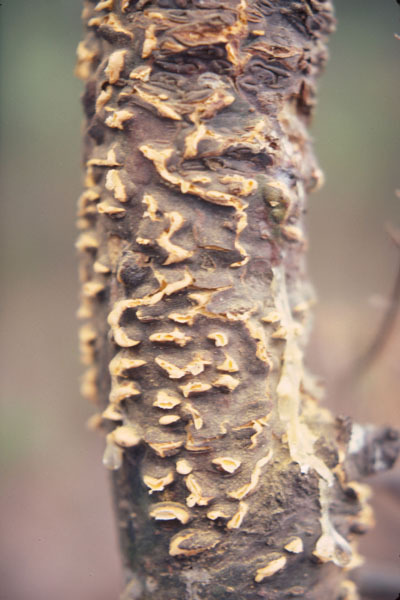 The following spring, these spores cause white blisters to form on the bark. The white fruiting bodies give rise to a canker that keeps growing. The foliage above the canker yellows and then turns reddish brown. 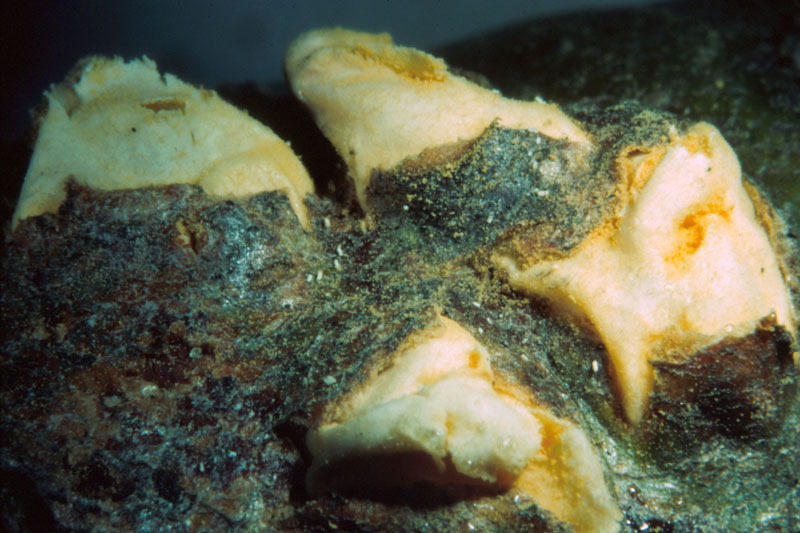 The mortality of the infected upper part causes the branch or stem to break, thus providing a point of entry for the decay fungus. The white fruiting bodies in turn produce orange spores that will be disseminated by the wind and infect plants in the family Ribes (red currant, gooseberry and black currant). Many generations of spores successively live on the undersurface of the leaves of plants in this family, thereby promoting the rapid spread of the disease over considerable distances. Finally, in late summer or early fall, some filamentous fruiting bodies develop on the leaves of the family Ribes. A last type of spores is produced and serves to transmit the disease to other white pines. White pine blister rust is a disease that was introduced from Europe at the turn of the 20th century. Economically, it is one of the most important forest diseases in North America. It brought about a decrease in reforestation of white pine in Quebec, despite the species' considerable commercial value. In many regions of Canada, the volume of white pine has been depleted to the point where it is no longer considered a viable commercial species. 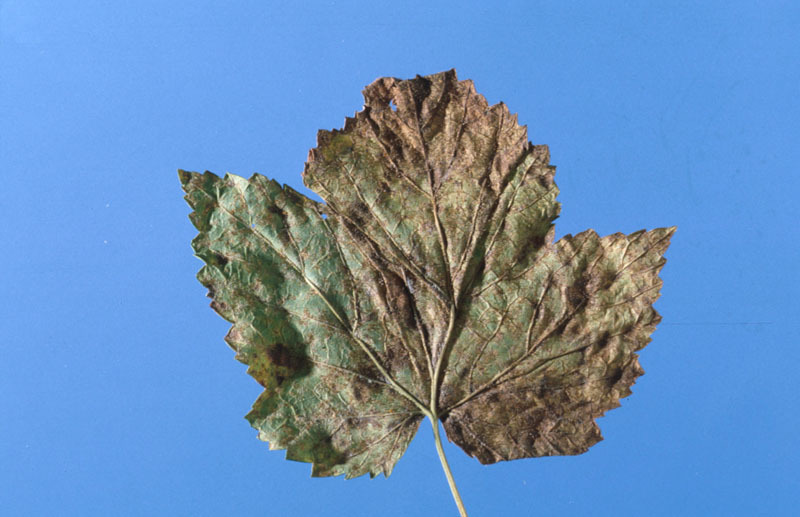 In eastern Canada, research (Dr. G. Laflamme, SCF-CFL) has shown that pruning of low branches, both infected and uninfected, could reduce the incidence of this rust in plantations where Ribes are absent or rare. White pine blister rust is the only stem rust of white pine and can therefore be easily distinguished from other similar rusts caused by Cronartium on the basis of this host preference. Basal stem cankers producing resin might also be confused with symptoms of Armillaria root rot, which can be distinguished by the presence of white mycelial fans beneath the bark. 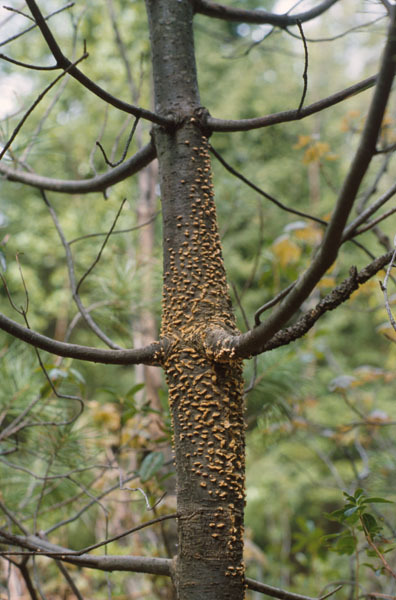 Life cycle: White pine blister rust alternates between five-needle pines and Ribes spp. (currants/gooseberries). Infection takes place through needles in the fall. The fungus grows into and down the branch toward the stem. It grows in the phloem and bark with no visible symptoms for at least three years before spores are produced. In the spring of the 3rd or 4th year, spermatia are formed, followed by the production of aeciospores in white blisters that break through the bark. 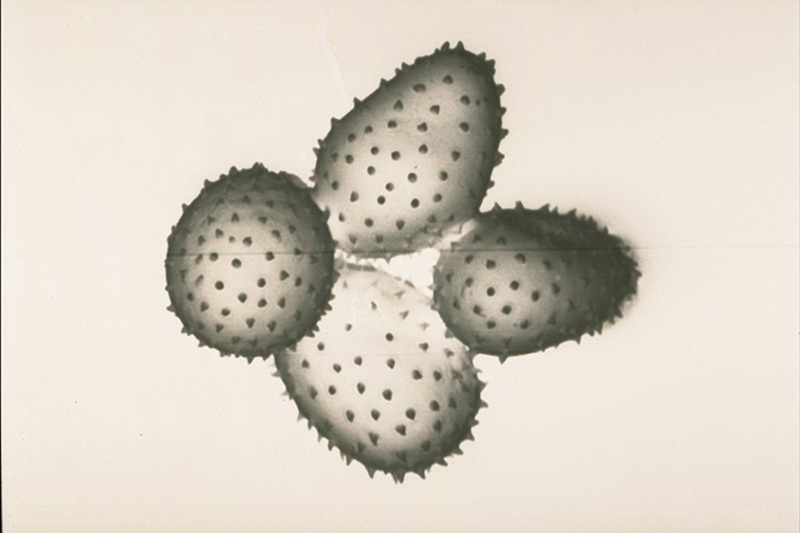 Aeciospores are capable of infecting only Ribes spp. 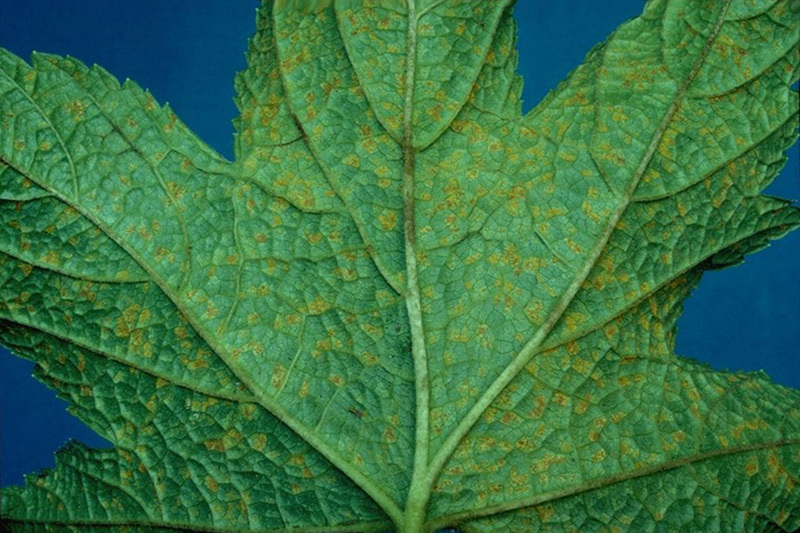 Approximately 10 days after infection, urediniospore development starts on the leaves and continues throughout the summer. Urediniospores are able to reinfect Ribes spp., thus intensifying the disease on this host. In the fall, teliospores and basidiospores are produced on Ribes spp. that carry the disease back to pine, there by completing the life cycle. Myren, D.T. ; Laflamme, G.; Singh, P.; Magasi, L.P.; Lachance, D. 1994. Maladies des arbres de l’est du Canada. Ressour. nat. Can., Serv. can. for., Administration centrale, Dir. générale des sciences et du développement durable, Ottawa (Ontario). 159 pp. Myren, D.T. ; Laflamme, G.; Singh, P.; Magasi, L.P.; Lachance, D. 1994. Tree diseases of eastern Canada. Nat. Resour. Can., Can. For. Serv., Headquarters, Science and Sustainable Development Dir., Ottawa, Ontario. 159 pp. Hunt, R.S. 1983. White pine blister rust in British Columbia. Can. For. Serv., Pacific For. Cent., Victoria, B.C., Forest Pest Leaf. No. 26. Ziller, W. G. 1974. The tree rusts of western Canada. Can. For. Serv., Publ. No. 1329. Victoria, B.C.